Justin Bieber rocked Sunday’s MTV Video Music Awards, and then he just took off. Literally. After performing two songs tonight, Bieber, attached to a harness, took to the enclosed skies of L.A.’s Microsoft Theater. The tears flowed afterward, and not just from the teenage girls in the audience and the tweens at home — the singer himself broke down after the pulley operators let him down. First things first, though. Flanked by dancers all in white, Bieber was blacked-out head to toe during his VMAs performance, which took place following a commercial break mid-show. There was no introduction before his moment, but the pomp and circumstance didn’t take very long to surface. Bieber kicked his mini-set off with “Where Are U Now?” and a high-energy dance routine, flanked by six male backup dancers. He quickly cut the tease and broke into his new single, “What Do You Mean?” — that was when the female steppers joined him and turned it up a notch or two. After, a prerecorded voiceover by Bieber let him sneakily get in the harness for a little stunt flying. 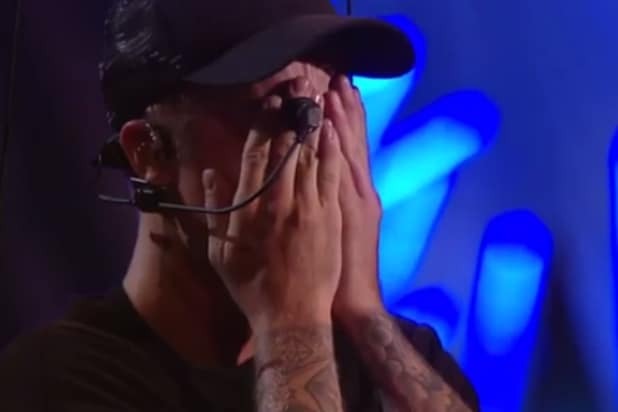 The performance ended with a seemingly gassed and emotional Bieber bawling on stage. Other performances on the night included Nicki Minaj with Taylor Swift, Tori Kelly, Demi Lovato and Iggy Azalea, Macklemore and Ryan Lewis with Kool Moe Dee, and The Weeknd, among others.